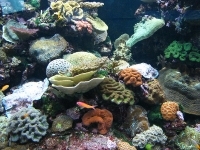 One of the largest living coral reef aquarium in the world, the Reef HQ Aquarium was built as part of the Great Barrier Reef Marine Park Authority. Featuring 130 species of coral, 120 species of fish and plenty of star fish, sea urchins, sponges and sea cucumbers, Reef HQ also features a predator exhibit, a children's section, a gift shop and a café to provide refreshments. A trip to the Reef HQ Aquarium is a must for all visitors who plan on taking a dive at the Great Barrier Reef, to learn more about the species of marine life they might encounter while exploring the miraculous underwater world. The Aquarium is a great attraction for families in Townsville, especially on a rainy day.